Recently, I’ve had the baking bug. I attribute it to our staying in town on the weekends. We went through a four-week stint where we traveled every weekend. All of that traveling made my weeks crazy trying to cram everything in and prepare for the next weekend’s travel. I have loved being home on the weekends and back in the kitchen. Over the last couple weeks I’ve baked pumpkin chocolate chip bars, homemade crackers, peanut butter chocolate chip bars, pita bread (twice!) and these muffins. 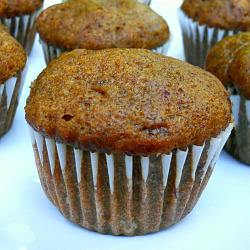 The inspiration from these muffins came from a can of Libby’s pumpkin puree in my pantry that was calling my name. I came home one night and it was rainy and cool. I immediately headed to the kitchen and started paging through my favorite cookbooks for pumpkin muffin recipes. I found a Pumpkin Apple Bread recipe in The Gourmet Cookbook and decided to adapt it to be a bit healthier and muffin form. The modifications I made included halving the recipe, subbing some of the all-purpose flour for whole wheat, reducing the sugar, cutting back on some of the oil in favor of applesauce and omitting the streusel-like topping in favor of a small sprinkle of brown sugar and cinnamon. The muffins turned out great, even with the modifications! Usually Brandon can immediately tell when I’ve “healthified” things but he was totally on board with these and ate them every morning for breakfast. I think my favorite thing about these muffins is the addition of diced apple. How perfect is it that this recipe includes two of the best Fall baking ingredients!? These are a great change from my normal banana muffins and I will be baking them again this season! Preheat oven to 350 degrees. Prepare a 12-cup muffin tin with liners (or cooking spray). In a large bowl, whisk together flours, baking soda, salt, cinnamon, nutmeg and cloves. In a separate medium bowl, mix together pumpkin, oil, applesauce, sugar and eggs. Add wet mixture to flour mixture and stir until combined. Fold in apples. Divide batter between muffin tins, filling about 3/4 (or a tad more) full. Sprinkle brown sugar and cinnamon over the tops of muffins. Bake for 22-25 minutes, or until a wooden pick inserted in the center comes out clean. Transfer to a wire rack and let cool completely. Muffins will keep for 3-5 days out or freeze well for a couple of months. And yet another dessert recipe makes its way into 68 Days of Gourmet. I told myself that I wasn’t going to make any more desserts and that I really needed to make appetizers instead but then I found myself with a serious craving for an apple dessert last night. It was totally worth it. Does it get any better than warm apple pie/cobbler/crisp and vanilla ice cream? So basic but so satisfying. Comfort food dessert. I love how easy crisps are – no fooling with pastry crust. I think this was ready to go in the oven in less than 20 minutes – including peeling and cutting the apples. There is nothing fancy about this recipe – it’s just basic and delicious. I must recap my weekend for you. It was definitely jam packed on the fitness front. Friday morning I attended hot vinyasa at Y2. I am convinced that this is the perfect way to start off a Friday and kick off the weekend. I literally pop out of bed when my alarm goes off at 5:45 and I am NOT a morning workout person! I taught BodyPump Saturday morning. I was still pretty sore from teaching last Thursday (I guess my body was a little weak coming off of the sickness) but there’s nothing like seeing 21 people up bright and early on a Saturday to get you motivated! I’m really loving that I’m starting to recognize faces and get to know some of the regulars in my classes. Saturday afternoon was all about the yoga. Last week I signed up for a 3-hour yoga boot camp at Y2. It was 2 hours of hot vinyasa and one hour of long slow deep (holding positions for 5+ minutes). Being relatively new to my practice, I was pretty nervous. I am so happy to report that the class was awesome and I not only survived but felt great. I even managed to be one of 3 or 4 people to hold a plank for 5 minutes! I love the feeling I have at the end of a big fitness achievement (finishing a race, surviving yoga boot camp, etc). It’s great to know that you’ve given it everything you have! Preheat oven to 375 degrees. Butter a 3 1/2 to 4 quart baking dish. Combine flour, sugars, cinnamon and salt in a food processor and blend until well combined. Add butter and pulse until mixture forms large clumps. Transfer to bowl and mix in pecans with your fingers. Alternatively, whisk together the flour, sugars, cinnamon and salt and work in butter and pecans with your fingers or a pastry blender. Whisk together sugar and cinnamon. Peel, quarter and core apples and cut into 1/2-inch thick slices. Add apples, lemon juice and orange zest to sugar mixture and mix until well combined. Spread apples in prepared baking dish. 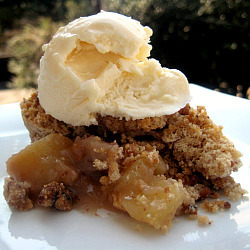 Crumble topping evenly over apples. Bake until topping is golden brown, 45 to 60 minutes. Let cool a bit and serve warm. *Note: I easily cut this recipe in half and used a smaller baking dish. A couple weeks ago I was doing some maintenance on my blog and updating my categories. I was astonished to find that I had no pork chop recipes on the blog. We love pork chops and eat them frequently. Our favorite are the thick cut, bone-in chops. They’re so reasonably priced and a nice alternative to chicken. They’re great pan seared or thrown on the grill. I found this recipe for Pork Chops with Sauteed Apples and Cider Cream Sauce in The Gourmet Cookbook and thought it would be a nice fall/winter preparation. 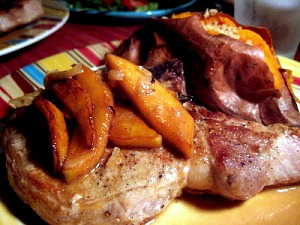 The sauteed apples and cider gravy were the perfect topping for the pan seared pork chops. It was a great meal served alongside sweet potatoes and a side salad. Melt one tablespoon of butter in a medium heavy sauce pan over medium-low heat. Add shallot and cook, stirring occasionally, until tender, about 5 minutes. Add apple cider, vinegar and sage and bring to a boil. Boil until reduced to about 1/2 cup, about 8 minutes. Add 1 cup stock and return to a boil. Boil until reduced to about 3/4 cup, about 12 minutes. Add cream and boil until reduced to about 1 cup, another 8 minutes. Meanwhile, pat pork dry and sprinkle generously with salt and pepper. Heat 1 tablespoon butter in a large skillet over medium-high heat. Add chops (if cooking 6 you will have to cook in 2 batches) and cook, turning once, until just cooked through. This should take about 6-8 minutes and internal temperature should be 145 degrees. Transfer to a plate to let rest and cover loosely with foil to keep warm. Pour fat from skillet and add remaining 1 tablespoon of butter. Add apples and cook over medium heat until golden and just tender, about 5 minutes. Transfer to a bowl and toss with brown sugar. Add remaining 1/4 cup stock to the skillet and deglaze by boiling over high heat and scraping up the brown bits for 1 minute. Stir deglazing liquid into sauce along with any accumulated meat juices and salt and pepper to taste. To serve, top pork with apples and ladle sauce over. *Note: I cut the sauce recipe in half and used one apple for 2 pork chops. One of my all-time favorite cakes is Apple Spice Cake. I loved when my mom baked them growing up. My favorite two desserts that she made were apple cake and banana pudding. I always requested them and my chances that she’d make them got a lot better when I moved away from home :). Now that the weather is getting cooler and apples are coming into season I found myself craving an apple cake. The recipe my mom uses calls for a lot of vegetable oil and I decided to try a new recipe that featured butter instead. I researched recipes for a while and found this recipe from Cooking Light that sounded great and had received awesome reviews since it was originally printed in 1997. Now, I kind of disagree that this is a light recipe but if they say so…I guess I’ll let myself feel better about it. But how can a cake be light when the recipe includes a stick of butter and cream cheese? All that matters is that this cake is so good I ended up baking it three times last week. Once for us, once for my sister-in-law (who is expecting her second soon!) and once for my mom. The cake received outstanding reviews from everyone. My sister-in-law texted me the day after it was dropped off and said she’d already had two pieces for dessert and one for breakfast. And she used it as a bargaining tool to get our niece to eat her meals. She said that Emerson loved it so much she would tell her she could have one bite of cake if she ate a bite of her dinner. And I’m very happy to report that my mom approved of the new recipe and even asked for it. So it was a success all around. The directions call for baking this cake in a springform pan and it gives it a great height that you can’t get from a standard cake pan. I changed the recipe up a bit by changing the mixing method and adding extra cream cheese, nutmeg and chopped pecans. I think the pecans are a must in this cake. This Apple Cinnamon Cake stays moist for days and is definitely a fall crowd pleaser.I admit that I ate it for breakfast and dessert! It’s delicious served warm with ice cream! Preheat oven to 350 degrees. Mix together a little bit of cinnamon and sugar (about 1/4 teaspoon cinnamon and 3 tablespoons sugar). Grease a 9-inch springform pan with butter wrapper or cooking spray. Sprinkle with cinnamon sugar mixture and tap sides to evenly distribute. Set aside. In a medium bowl, combine flour, cinnamon, nutmeg, baking powder and salt. Whisk together well to incorporate. Set aside. In the bowl of a stand mixer, place 1 1/2 cups sugar, cream cheese, butter and vanilla. Mix on medium high speed until lightened in color and fluffy, about 4-5 minutes. Reduce mixer speed to low and add eggs, 1 at a time, beating well after each addition. Add flour mixture to cream cheese mixture a little at a time, beating at low speed until well blended. Mix in apples and pecans. Pour batter prepared pan. Bake at 350° for 1 hour or until cake pulls away from the sides of the pan. Cool completely on a wire rack.